Intriguingly complex and yet simply distinct, The Kasbah introduces the flavors of Morocco to the world of grilled cheese. It features dried fruits, tabbouleh, pistachios, and spicy, grilled ras el hanout veal paired with Wisconsin white cheddar, fontina, and crumbled feta cheeses. 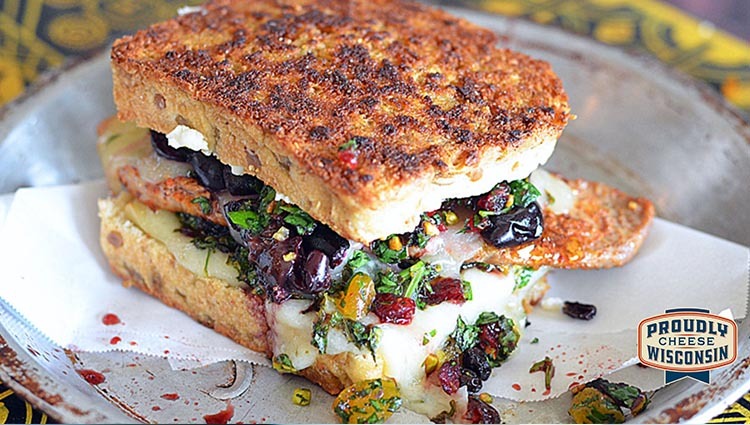 Who said grilled cheese can’t be exotic? Recipe, copy and photo copyright Dairy Farmers of Wisconsin. For tabbouleh: In medium-size bowl, combine all ingredients; blend well and refrigerate until ready to complete sandwich. For cutlets: In heavy skillet over medium heat, melt butter. Rub ras el hanout into both sides of veal slices. Place in hot skillet and cook on each side about 2 minutes. Remove to plate and cover. For sandwich: Blend butter and cumin well in small bowl. Slather 1 side of each bread slice with mixture. Place 1 bread slice in heavy skillet over medium heat, butter-side-down. Top with fontina slices. Cover skillet with lid to start the cheese melting while bottom of bread gets golden brown. Place this slice in pie pan and put under hot broiler to complete melting cheese, if necessary. When melted, remove from heat (but keep broiler hot) and spread about 1/4 cup of tabbouleh over fontina. Place veal slices over tabbouleh and top with cheddar cheese slices. Place under broiler (not too close) until cheddar melts, about 60-90 seconds. Remove and press cherries into melted cheese. Spread with another layer of tabbouleh over. Top with remaining bread slice, buttered-side-up, and place in skillet over medium-high heat, turning so butter side is down. Grill about 60-90 seconds or until golden brown. Remove and place in pie pan. Sprinkle crumbled feta over and place under the broiler about 60-75 seconds. The feta will soften then spread with a butter knife. Serve.